PTI covers and lids provide weather protection for aerial baskets. 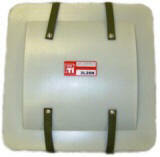 Seal your aerial basket with either our Soft Covers or Hard Covers. The Soft Covers are double sided for double the life. The foam creates a semi-rigid profile that allows water to run off, yet can be comfortably stored. The No Foam Soft Covers offer a light weight weather resistant seal for your bucket. Constructed of the same quality materials as our Soft Covers with foam. The Hard Covers (called Lids) provide rigid protection for snow and ice build up. Constructed of rugged polyethylene with UV. Inhibitor added. These lids are light weight yet are strong and impact resistant.